You must be a member of the Istanbul Singles Group to attend this activity. Would you like to join this group? What we all want in life: to travel, fall in love and be happy. We are going to Beirut (Paris of the Middle East) in April. You will only need to take the Friday off and maybe some morning hours on Monday. Join us and be part of the FUN and ADVENTURE! We will have a chance to meet with Beirut InterNations Members!!! Our private transportation will take us to our hotel to rest for the evening. the Temples of Baalbeck, with a private transportation. The UNESCO-recognized Roman archaeological site known as Heliopolis (City of Sun). It holds some of the world's greatest historical and best preserved Roman sites. The Roman gods were worshiped in its Acropolis (constructed between 1st –3rd Century AD). In Jupiter Temple, only six columns remain out of the 54 giant columns that originally surrounded the sanctuary. The temple was built over a Phoenician podium dating from around Protected content . The city of Baalbeck has major remains from Islamic times including the Grand Mosque built by Omayyad Caliphs, with material borrowed from ancient monuments, and Mamluk mosque. Lebanon has one of the oldest wine cultures in the world, dating back 5,000 years when the Phoenicians first began tending vineyards. There are about 50 wineries producing approximately 9 million bottles a year. Chateau Ksara is one of the oldest wines are exported to over 42 countries. Encompasses Protected content , is a rich agricultural area with gorgeous vineyards and orchards. It has a great lake with ducks roaming in them surrounded by alleys of very tall trees and beautiful vineyards. It remains one of the rare places in Lebanon with well-conserved and much varied woodlands and wildlife. Jeita Grotto, with a private transportation. The teleferique takes passengers from Jounieh to the Church of Our Lady of Lebanon in Harissa, some Protected content up. A huge, 15-ton bronze statue of the Virgin Mary, known as Our Lady of Lebanon or Notre Dame du Liban/Harissa, with her arms outstretched adorns the bluff high above Jounieh inaugurated in Protected content . One of the oldest towns in the world. It was in Byblos where the first linear alphabet was found, ancestor of all modern alphabet. 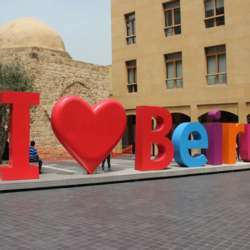 Half Day Beirut Historical Walking Tour and free time in the afternoon for shopping, more site seeing, or just chill'n. Then very early in the morning of Monday around 4:30am, we head to the airport for our Pegasus 6:40am flight PC863. We arrive to SAW at 8:30am. We can head straight to our jobs. You will only need to take that Friday off and maybe some morning hours on Monday. Cost per person For 4-night stay is listed below. The more people join us, the more cost will go down. Double Shared Room (king size bed or two single beds): US$475 per person plus US$160 Pegasus round trip (during promotion US$120, gotta catch it!). Single Room: US$730 per person plus US$160 Pegasus round trip (during promotion US$120, gotta catch it!). Almost all Western & Arab nationals enter Lebanon without a need for a visa, however it is each traveler's responsibility to contact the Lebanese Consulate to verify their requirements and arrange their own visa if required. Travel insurance is to be obtained by each traveler prior to travel, if he/she wishes.